Great deal for a private room for two (two beds, one bath). 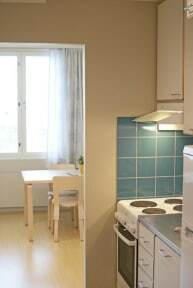 great location within walking/biking distance from everything of interest in Helsinki. There are two bike rental stations right outside the hostel and a grocery store across the street. Very friendly and helpful staff, great overall experience. The room we got was a small apartment with small stone and fridge. the room is big enough for 3 people and beds were comfortable. good location and staff are friendly and provide good information about the city. This hostel is run like a hotel but without the price tag. The staff are amazing and even looked stuff up on the internet for us when we asked about going somewhere. I would not hesitate to stay there again, as long as i have a wallet large enough for the huge amount of cash I would need to visit Helsinki. I stay 2 days in a single room, they have good facilities in the room with little kitchen, but too few people in the corridor. I only can chat with others in the lobby. The staff was really friendly and the hostel had postcards and flag patches. The luggage storage was also great. The hostel layout was very confusing, but that might have been the fact that it was dark and we were tired. The building we slept in was right next to a busy road, which made it extremely noisy. It would have been better if the window was closed, but because of the extreme heat, we couldn't close the window. Other than that, it was a very clean hostel and the room was spacious enough. Perfectly fine. Could use lockers in the room for your stuff and the buildings are a bit spread out from the communal area. Sadly it is not a good place to meet people. Also it became a home for students the day after I left, so there were only students who had programme all day. Maybe a good place for people who come to Helsinki for academic reasons, not so for backpackers.